When I originally heard about this series my first thought was “not another vampire hunter book” but, I quickly changed my tune when I met Jane’s Beast. I enjoyed the alternating POV’s of the main character, the large variety of unique supernaturals in the Jane Yellowrock universe and Faith Hunter’s descriptive yet action-packed writing style. 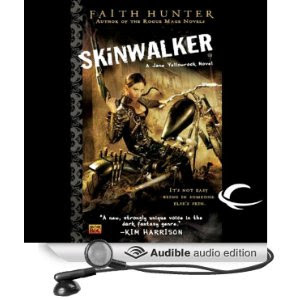 Khristine Hvam’s superb narration also played a key role in my enjoyment of this audiobook; her transition between characters was smooth and I loved the way she read Beast’s parts. For a novel about a skinwalker, Hunter reveals a surprisingly large amount of information about all of the other paranormals in her world except for Jane, the character that I most wanted to learn more about. Frustrating, yes, but the continued mystery surrounding Beast was even more maddening. Out of all of the creatures introduced in this book I enjoyed the witch mythology the most. I think this is the first time that I’ve come across magic practitioners that aren’t portrayed as human. Granted, there are tons of series’ out there where they evolve over time into something more but in this case, they are something other from the get-go which I found to be an interesting twist on the typical witch. I loved the back-and-forth between Jane and her Beast; they aren’t always in agreement as to the correct course of action in a given situation which made for some wildly entertaining internal arguments. Yellowrock’s POV was pretty much what I’ve come to expect from an Urban Fantasy heroine but Beast’s was something else entirely. Her perspective is more instinctual; she talks in halted sentences and is more hyper-aware of scents/sounds than your typical protagonist. I really felt like I was experiencing Hunter’s world from an animal’s POV, albeit a very intelligent one. This is also where Khristine Hvam’s narration really shined; her tone and rhythm captured my impression of Beast perfectly and then brought it to life. My biggest annoyance with this book was the lack of information where the main character is concerned. Normally I complain about too much information in the first installment of a series but in this case it was too little. Beast knows a lot more about Yellowrock and how they came to be together than she is letting on which again, frustrated me to no end. I couldn’t resist asking a friend who’s a few books ahead of me if more is revealed in the next installment because I don’t think that I could stand being strung along for too much longer. I need a lil’ something to keep me going! Luckily her response was affirmative so here’s hoping that Blood Cross sheds some light on a few of this duo’s secrets. Aside from that, Skinwalker breathes new life into vampire hunter story line and takes talking to yourself to a whole new level of crazy. I look forward to seeing where this series goes from here. Isn’t Beast awesome!!! I’m so glad you’re enjoying the series…it’s a must read/buy for me and it just keeps getting better! Beast IS awesome. I might even like ’em more than Jane! I know how you feel. I just finished catching up on the Kate Daniels series too. *sigh* It’s never ending! I love this series. One of the best aspects of it is how Hunter paces Jane’s backstory over the arc of the series. It’s very well done. Glad you enjoyed it! That’s what annoyed me the most about this first book. LOL Hopefully it doesn’t bug me for the entire series. Okay, you’ve convinced me. I have added this audiobook to my wishlist. I love Hvam’s narrations! I have been wanting to start this series for a long time now, and even have the first few books on my shelf. Thanks for the review Carmel, now I really will start them soon!